This exceptional 2 bedroom, 2 full bath, den single 1st level unit is centrally located in Scottsdale, AZ near Scottsdale Road and the 101. This 1881 sf luxury condo has been professionally decorated and remodeled and is fully equipped. Feel at home as you walk into a spacious open living room w/ large plasma HDTV screen, Bose surround system, DVD, lots of comfortable seating to maximize your enjoyment, and gas fireplace. The large dining room includes a spacious round table w/6 chairs and 3 bar stools. The gourmet kitchen has granite countertops, stainless steel appliances, and is fully equipped with cookware, flatware, dishes, glassware, and small appliances. Den/Study is equipped with all-in-one copy/printer/fax, high speed internet, desk, comfortable seating, and beautiful dark hardwood floors. 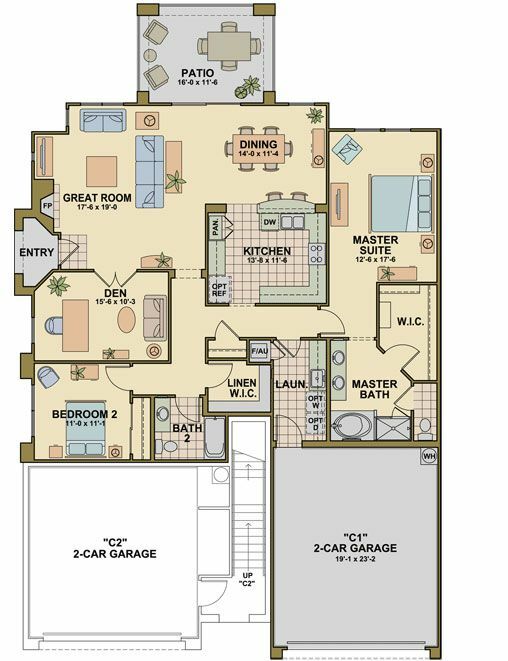 Split bedroom floor plan gives guest plenty of privacy when needed. Large master suite w/ king size bed, flat screen TV, walk-in custom closet, full bath with separate tub & shower, and granite countertops. Second bedroom has queen size bed, full length closet mirrors, flat screen TV, and own private full bathroom. Custom window treatments & bedding throughout unit. Generously sized laundry room with front load washer and dryer as well as a stainless steel wash sink. Large patio with comfortable seating. Attached 2 car garage with additional outdoor parking. This unit is located in a gated community that offers a heated pool, spa, fitness room, gas BBQ grills, and tables. Minutes to Loop 101, fine dining restaurants, shopping, premier golf courses, movies, nightlife, Kierland Commons, Scottsdale Quarter, Market Street @ DC Ranch, and Desert Ridge. The community is also connected to plenty of walking/running trails through-out Grayhawk. Come enjoy Scottsdale in this amazingly beautifully decorated condo! No pets. All linens/towels/pool towels provided. Grayhawk: Grayhawk is an upscale community that offers visitors and residents the best of Scottsdale. The famous Grayhawk Golf Club, a public golf course, includes the award-winning 40,000 square foot clubhouse, with golf shop, fine dining, including Phil's Grill (named after Phil Mickelson at his home course here) and Quill Creek Cafe. There are 30 miles of hiking, cycling, and jogging trails, as well as a neighborhood shopping center with restaurants and modern, large grocery, all available by foot. The Grayhawk area is home to the Phoenix Open, the Barrett-Jackson Auto Auctions, the Arabian Horse Show, MBL Spring training, and many other Valley-Of-The-Sun tennis, golf, and equestrian events. If this is the first time using a Vacation Rentals in place of a Hotel/Resort you are in for a treat. Your Scottsdale Rental Home will be cleaned and managed to hotel standards. I will be on call during your stay to answer any questions or to solve any unforeseen issues. Scottsdale home rentals have become a very popular alternative to expensive resorts in the area and I am confident you will have a memorable and enjoyable stay in this North Scottsdale. Great location, great unit. We have stayed multiple times and are making plans to rent again. You will not be disappointed in any way. Thank you for the awesome review!! Enjoy the weekend!! My husband and I just completed another wonderful stay at this fantastic property in Grayhawk. It continues to exceed expectations as a VRBO rental with wonderful furnishings, supplies, appliances, amenties and decor! The unit is impeccably maintained, extremely well-stocked and every need is cared for by the owner. The location is terrific with close proximity to shopping, restaurants and other major Scottsdale venues. Bobbie is very responsive to any question or need that might arise! We love working with her and thoroughly enjoy this “home away from home” at her delightful condo! A five-star property for sure!!!! Thanks so much for this sweet review! I greatly appreciate you taking the time! Enjoy the weekend!! question. The condo is located in a beautiful area with wide sidewalks and lovely desert landscaping. It is near the gated entrance which makes it very convenient. You can walk to a Fry's grocery store and many restaurants within a mile. Hiking Pinnacle Peak Park is only 15 minutes away. The condo itself deserves a 10 rating. It is beautifully decorated with high end furniture and linens. Every detail is coordinated. The master bedroom is large with a walk in closet and closet system, two sinks in the bathroom, large glass shower, oval bathtub. There is a TV in both bedrooms and the great room. Having a garage was so convenient. You can walk right into the unit with groceries. It was lovely sitting out on the covered patio watching the sunset. We were impressed at how clean and nice everything was. We will definitely rent here again. Thank you Bobbie! Kim G.Where do you live? This is our 4th or 5th year of staying at this property which is always super clean and well maintained. The home is well appointed with comfortable furnishings and the kitchen is stocked with all the dishes, pans, glasses & utensils you need to prepare meals at home. The condo is located near plenty of restaurants, shopping, and outdoor activities. The well maintained exercise room & pool are just a few steps from the condo and the grounds are nicely landscaped. The homeowner has always been a pleasure to work with and responsive to any questions before or during our stay. We are as comfortable in this condo as we are in our own home. Awwhhhh! That is great that you feel at home. Thanks so much Kim for the awesome review!! I look forward to your next stay! Happy Holidays!!! We love staying at this property in Grayhawk. The condo is clean, beautifully appointed and has all the comforts of home with wonderful amenities. The owner is wonderful to work with and very responsive. The location provides great access to all Scottsdale has to offer. We look forward to a return trip to this fabulous home! Thank you so much for the lovely review!! I look forward to your next visit! Safe travels! !